Well, Week 2 of our study is officially wrapped-up. How did you do? If this is your first time here, don't despair, the How to be Thankful study is meant to be a lesson for the whole year through... pick it up and try it at any time! This is the one thing I get asked every time we have Thanksgiving company... how do you get your turkey so juicy. Not once does a guest see me open my oven and baste my turkey. The answer: old family recipe. I like to put my bag in the roasting pan (on its side with wide side along the bottom) before moving the bird, it makes this next step easier. Slip bird inside of bag so the wide end of the bird almost touches the bottom/or back of the bag.... don't worry if the bag is touching the bird on any side. The margarine keeps it from sticking. I usually put my hand and forearm into the main cavity of the bird and lift it into the bag that way. Pour about 1-1 1/2 cups wine inside of bird. Seal bag using stapler or paper clips. You won't be opening again until much later. Don't worry about the alcohol in the wine, it roasts out and is completely safe for children, pregnant moms and the rest. You can carefully open the front of the bag when the time is up and pop a thermometer in to verify it is cooked to the right internal temperature. When it is done, I have used the tip of letting it rest for about 30 minutes before carving. Seems to work well and opens up the oven for all those last minute dishes best served hot like green bean casserole and yams! While these last few items are doing their thing, the paper bag will easily tear open, we unusually open along the top as seen in the above picture (sorry for the blur). Hubby was so sweet last year to don my apron and get to work teaching Brenden how to carve. Doesn't that bird look pretty? I slipped in and siphoned out some of the drippings from the turkey and made gravy while he worked. I have no special gravy recipe. I swear by Wondera and use it for ALL my gravy needs year round because my gravy is perfect EVERY time just by following the directions on package. If you haven't heard of it, you can find it in the baking isle around the flour and corn starch. Corn on the cob.... I pile into one of the included smaller pans which rests along the top. Stove Top Dressing... I put into a serving dish and place on the bottom of the roaster. Mashed Potato... I put into a serving dish and place on the bottom of the roaster. Dinner rolls... I wrap in a towel or foil and place in roaster. I also put a dish of water in the roaster to create warm moisture so the food doesn't dry out while it warms. I LOVE a pretty table... especially at the holidays. Since going in and out of the mission field we haven't had company for Thanksgiving (everyone we know locally has family they go to for dinner). Still, having grown up in a large family with parents from large families, I have been use to a lot of people, a lot of food, and the idea that the day is set apart from others. So how do I compensate for this? - I REQUIRE best dressed (or at least best Sunday dress) before anyone is allowed at the table. Ties are optional. It was the talk of the evening! Our activity actually doesn't happen on the DAY OF Thanksgiving, but rather, the week of, in order to break up the boredom of a week off of school. I am a big Charlie Brown fan and I love all their movies. My favorites are the holiday ones and Thanksgiving tops the list. If you haven't seen it, it is a must-buy. 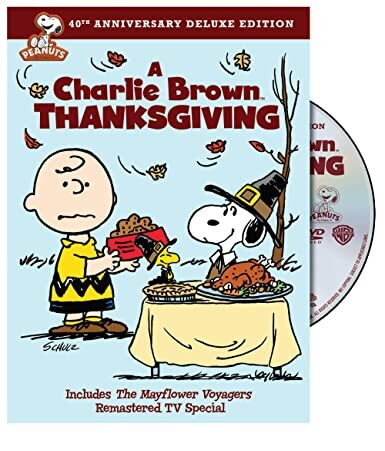 Peppermint Patty invites herself and a few friends over to Charlie Brown's house for Thanksgiving Dinner but 'ol Chuck and Sally are suppose to be going to Grandma's for the big meal. So, they compromise by having an earlier meal with their friends. Only one problem: Charlie Brown doesn't know how to cook anything except toast! With the help of Snoopy and Linus they pull off their own meal.... you have to watch the movie to see how it turns out! When my kids were still small I got the funny idea of having our own Charlie Brown Thanksgiving. The menu is strictly movie related... down to the specially folded napkins and table cloth! One exception: we don't eat outside at a ping-pong table! We watch the movie while enjoying our 'dinner' in the living room (in order to view the t.v.) and we invite friends. In the pictures here from the year we stayed with my mother-in-law before heading into the mission field, my nephew joined us. My kids are now from middle school to college age and they still ask for this fun tradition! That is all! I sort of winged it with the parfait, mixing prepared strawberry jello and cool whip, topped with a dab of whip and cherry on top. Some things are just timeless! What recipes and Thanksgiving dinner traditions are favorites in your family?